It seems as though the history between the AHL's Manitoba Moose and Chicago Wolves gets a little more storied everytime these two franchises square off. Whether it be an individual's performance, a playoff battle, or a war on the ice, these two teams have been creating highlights and history since their time in the now-defunct International Hockey League. Last night at the Allstate Arena in Chicago, another chapter was written into the history books between these two clubs, and it is one that might make blooper reels for a while. In the middle frame with the score tied at zero, Pierre-Cedric Labrie scored for the first time in 36 games to open the scoring for the Moose. Bryan Little responded for the Wolves minutes later to tie the game. Kevin Bieksa, on a reconditioning assignment for the Canucks, recorded an assist on Labrie's goal, and looked as though he hadn't missed any time with a lacerated calf muscle. His conditioning stint lasted only one night as the Canucks recalled him immediately after the game for their Thursday night game in Nashville. The teams remained tied through the third period at one goal apiece, which means that overtime and possibly a shootout would be needed to find a winner. Well, the game did end in overtime by the most unlikely of players to score the winner. 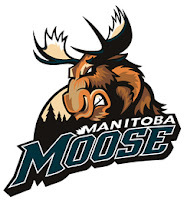 Moose forward Jason Jaffray had been singled out by referee Ryan Fraser for hooking, and allowed the play to continue with the delayed penalty awaiting a Manitoba player to touch the puck. Chicago goalie Ondrej Pavelec went to the bench for the extra attacker, and the Wolves played five-on-four. Steve Martins got the puck along the left wing boards, and flipped a pass back to the point. However, the pass was never received by anyone, and the puck slid the length of the ice into the yawning Chicago cage, giving Manitoba the 2-1 overtime victory. And the goal scorer? Manitoba Moose goaltender Drew MacIntyre. MacIntyre became the ninth goaltender to record a goal in the AHL, and only the second goaltender to record an overtime game-winner. By rule, he was the last Moose player to touch the puck before it went into the net, so he received credit. The goal was originally credited to defenceman Danny Groulx, but was later changed to MacIntyre. "It could have hit the knob of my stick, I don't know," MacIntyre said to Winnipeg Free Press reporter, Gary Lawless. "If it is mine, that's pretty cool. I'll take it. That's the bounces I guess." Let's go to the video for this goal. *Niittymaki also scored in overtime. The Moose continue their road trip with a trip to Van Andel Arena in Grand Rapids where they'll meet the Griffins and Darren McCarty. This should be another great game between former IHL foes. Until next time, keep your sticks on the ice! The photos found on this site belong exclusively to the photographer who captured the image. Hockey Blog In Canada claims no ownership of any photos, and will remove any images found on the site if requested by the owner.